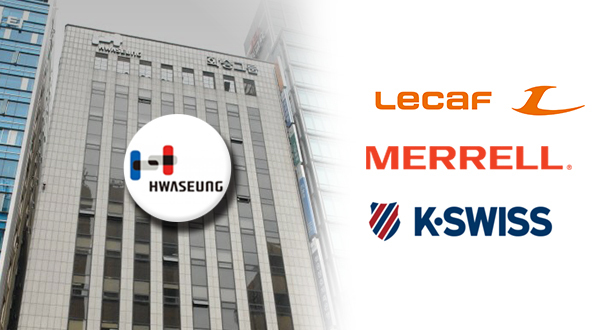 Hwaseung Corporation, South Korea’s footwear and sportswear manufacturer that owns Lecaf brand, filed for court receivership last week despite large-scale investments from a private equity fund in 2015 as the company has struggled to compete with mega-hit foreign brands. According to multiple sources from the fashion industry on Thursday, a local court approved the filing from Hwaseung on Friday, about a week after the company filed for a court-led reorganization program late last month. The court issued an order to prevent debt collection from creditors until its decision on the initiation of a rehabilitation procedure. Hwaseung, a local retailer of sportswear and outdoor brands such as Lecaf, K-Swiss, and Merrell, began a growth curve in 1978 when it became an original equipment manufacturer for global footwear label Nike. The company terminated its OEM partnership with Nike in 1986 but it launched its own brand Lecaf with hopes to expand its presence in the bourgeoning industry. The company enjoyed its heyday from mid-1980s to mid-1990s amid brisk Lecaf sales in Korea and overseas. Hwaseung received the $500 million Export Tower Award and Gold Tower Order of Industrial Service Merit in 1990 thanks to stellar performance driven its Lecaf brand. The company exited special court protection in 2005 after struggling to overcome the fallout from the Asian financial crisis in 1998 and its immediate bankruptcy. Hwaseung flourished again amid growing demand for outdoor products in the country but it failed to compete with mega-hit foreign brands such as Nike and Adidas. Sales and operating income of license brands K-Swiss and Merrell also declined, making it inevitable for Hwaseung to turn to the court.